BAYLEY Fritsch's mentor once feared the gravity-defying Casey Demons forward would be lost to high-level football as a Jesse Hogan-type back injury lingered. 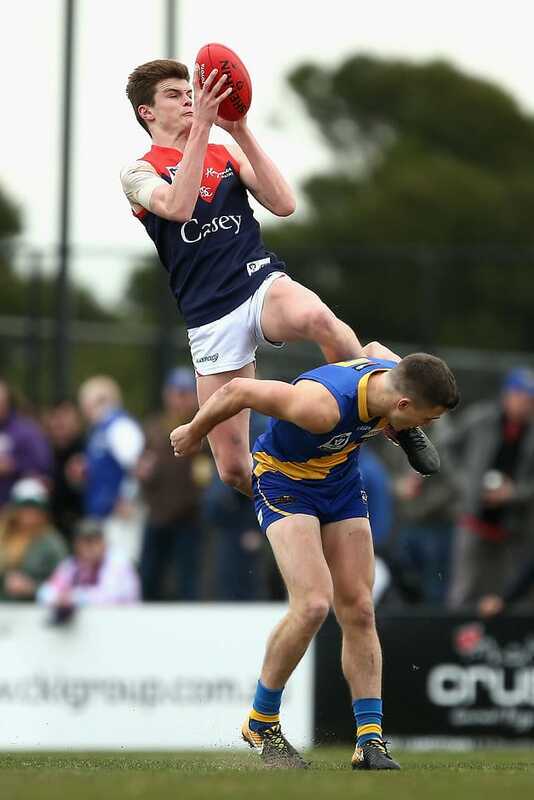 Fritsch was the skinny kid from Coldstream – a club stuck in the lower reaches of the Eastern Football League – considered not good enough to make the Eastern Ranges' TAC Cup list. The same kid with the raking left boot now has a dozen AFL clubs clamouring for his services. West Coast, which has five picks in the top 40 of the NAB AFL Draft, is arguably the keenest. Fritsch stacked 10kg onto his 186cm frame in the past three years to tip the scales at a still-slight 82kg, and his 2017 exploits earned him the Fothergill-Round Medal as the VFL's most promising player. The previous 11 winners – among them All Australian defender Michael Hibberd and premiership-winning Tiger Kane Lambert – went on to play in the AFL. Just four rivals kicked more than Fritsch's 42 goals in 19 games this past season, and he represented the VFL against the WAFL and was runner-up to Jack Trengove in Casey's best and fairest award. "I'm feeling a bit nervous, but I've just got to hope I've done the work and hopefully my dream comes true," Fritsch, who turns 21 in December, told AFL.com.au. "You hear of so many stories of people who've spoken to that many clubs and then their name doesn't get called out. "You can't get too confident, because you don't want to get shot down if it doesn't happen." It was only when whispers of Fritsch "flying" as a 17-year-old playing for Coldstream's seniors reached then-Casey assistant Nick Rutley, a family friend, that his career looked set to take off. But an ankle injury stopped Casey's plans to apply for a permit to play Fritsch three years ago. Stress fractures in his back – like what ruled Hogan out of the 2014 AFL season – ruined his first official VFL campaign, then a torn meniscus in his left knee delayed his 2016 campaign. Fritsch's body finally behaved this year and he was able to prove he not only belonged at state-league level, but that he might be even better than that. "I used to drive him from Healesville to Cranbourne and couldn't get two words out of him, but now, 12 to 18 months later, I can't shut him up," joked Rutley, a Carlton AFLW line coach. "His football ability and want to do it was never questioned, but self-confidence was an issue. "We established he was good enough, and then he started seeing some results that reinforced he could do it." Fritsch rises daily at 5am to start work as an electrician in the city and didn't get home until 10pm on training nights, such is the life of a VFL footballer. His ability to perform despite those trying circumstances is what excites Casey general manager Matt Young, who played 118 AFL matches at Hawthorn and St Kilda. "If you look at what Bayley was able to do; he was playing better than blokes on AFL lists, so it's a really great story of perseverance," Young said. "He can take a mark, he has a great vertical leap, he gets in the right spot in the contest and he's not just a good kick – he's an elite kick. "He's very quiet and very humble, but he's a great listener, and I think his football ability does all the talking for him … I've been at this club since 2010 and he's the most talented player on our list in that time." None of this would have been possible, Fritsch says, without Casey coach Justin Plapp's words of wisdom, Rutley's intervention or his family's support. His father, Scott, is a club legend and the games record-holder at Coldstream, his 18-year-old brother Darcy plays in the seniors for the Cougars and his uncle Nick pulled on the jumper, too. Fritsch won't be the first Coldstream footballer to enter AFL ranks, with 2006 All Australian Lindsay Gilbee, Guy Richards and Daniel Hargraves among the other success stories. "I would be very humbled to have my name alongside them, but there's still a bit of water to go under the bridge," Fritsch said. "I started playing seniors at Coldstream when I was 16 or 17, so although the natural way to get a look in is playing TAC, I reckon playing against those senior bodies early days helped me in the end. "It's probably made it a harder road, but I wouldn't change it."